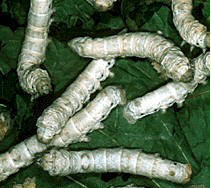 Artificial silkworm food and eggs can be ordered from http://www.mulberryfarms.com in reasonable quantities. It comes as a powder to which you add water. It works well with certain varieties of silkworm - but they will get bigger faster if they eat leaves. Silkworm eggs, books and other equipment are available from various sources. A third-grade class at Alvarado Elementary school in Union City, California has taken many wonderful pictures of silkworms growing in their classroom. Lao Sericulture Company, a small village-run silk products company in Laos. ** Please email the Webmaster if you find other worthwhile sites!